We're sorry, it seems like something went wrong. and we'd be happy to help. Alzheimer’s Disease, along with Parkinson’s Disease, is one of the leading causes of dementia, and it’s estimated that around 5.3 million Americans have Alzheimer’s Disease. The first symptoms of the condition usually appear after age 65, although there is believed to be 200,000 younger people in the United States living with early onset Alzheimer’s. There is currently no cure for this condition that is 100 percent effective. Symptoms of Alzheimer’s Disease vary by person, although Alzheimer’s patients will usually experience memory loss, confusion, and changes in mood and personality. These can be some of the most frustrating and upsetting symptoms of Alzheimer’s, which is why Alzheimer’s Disease research has been focusing on safe and effective ways to treat dementia, minimize the symptoms, and help to improve overall quality of life. One treatment for Alzheimer’s that’s become a big focus is Vitamin B6. Vitamin B6, also known as ‘pyridoxine’ or the ‘brain vitamin’, is one of 8 B complex vitamins. Together, these B vitamins are responsible for ensuring good brain function, producing energy, and repairing cells. Although each of the B vitamins is beneficial to the body, Vitamin B6 is widely considered to be one of the best B complex vitamins for treating the symptoms of Alzheimer’s Disease. That’s because Vitamin B6 benefits include improved memory function, according to experts, and research suggests that it could even help to boost mood, too, tackling two of the most common and frustrating symptoms of dementia. When looking at natural treatments for Alzheimer’s Disease symptoms, two of the most important questions to ask are ‘what vitamin is good for memory?’ and ‘what vitamin is good for mood?’. The answer to both questions is Vitamin B6, and significant research has been undertaken in this area. Vitamin B6 is one of the best vitamins to improve memory. In fact, a B complex deficiency can cause memory loss, according to healthcare professionals. Studies have found that memory — particularly long term memory — can be significantly boosted with 20mg of Vitamin B6 taken daily for at least 3 months. Exactly how Vitamin B6 boosts memory isn’t fully understood, although it is believed that this ‘brain vitamin’ helps to regulate levels of an amino acid called homocysteine. Low levels of homocysteine have long been thought to have damaging effects on the brain. Some studies have actually found that the extent of memory improvement with Vitamin B6 has been greater in patients with Alzheimer’s Disease than in those suffering from mild cognitive impairment, which gives a little extra support and backing for Vitamin B6 to be utilized as a safe and natural treatment for Alzheimer’s Disease, and for dementia. Vitamin B6 is also considered to be one of the best vitamins for mood, with research suggesting that a Vitamin B6 deficiency could be a contributing factor to feelings of depression and anxiety. Again, exactly how Vitamin B6 works to improve mood isn’t known, but it is generally accepted that Vitamin B6 is essential for creating a strong ‘pathway’ between an amino acid called tryptophan and the ‘happy hormone’ serotonin. When this pathway exists, serotonin can get to work, helping to regulate mood. Vitamin B6 is found naturally in meats and fish, nuts and seeds, leaves, and fruit. Vitamin B6 supplements may be combined with other B complex vitamins. The National Institutes of Health recommend a Vitamin B6 dosage of 1.3mg per day for adults. For those aged 50 and over, the recommended daily allowance of Vitamin B6 is slightly higher, at 1.7mg for men, and 1.5mg for women. Vitamin B6 is very safe. In the United States, the official ‘safe upper limit’ is set at 100mg per day, although it is stated that Vitamin B6 side effects are rare unless intake exceeds 200mg per day. However, Vitamin B6, and other vitamins for brain health, may sometimes interact with certain medications. This is especially true for those taking antibiotics, seizure medication, medication for Parkinson’s Disease, and antidepressant medications, the efficacy of which may be affected by increased Vitamin B6 intake. 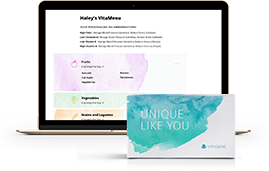 Includes a DNA Kit & Health + Ancestry Report — a detailed guide to your ancestry and tailored recommendations for diet, exercise, and supplementation. Previously had your DNA tested?